Particularly strong growth in container throughput of 12.3% (in tonnes) was the main driver of growth in the port of Rotterdam throughout 2017. Total cargo throughput rose by 1.3%, with the port returning to the growth trend seen before 2016. Total tonnage increased from 461 million to 467 million. The increase in containers was offset by a fall in dry bulk of 2.6% and in wet bulk of 4.1%. Break bulk (Roll on/Roll off and other break bulk) increased by 7%. Allard Castelein, CEO of the Port of Rotterdam Authority: 'The port of Rotterdam has had a good year. Led by the container sector, goods throughput rose to a record level. The container sector is particularly important because it plays an essential role in creating added value such as employment in the port and the hinterland. I am also satisfied with the high level of investment because it will allow us to facilitate our new and existing customers even better. And we can be happy with the pace at which we are implementing our plans for the energy transition and digitalisation. The Port Authority supports the goal stated in the Dutch coalition agreement to reduce CO2 emissions to 49% of the 1990 level by 2030. To make this happen, we are now appraising a large number of projects. Paul Smits, CFO Port of Rotterdam Authority: 'In financial terms, 2017 was a good year for the Port Authority, with higher turnover and a higher result before tax. As a result, we were able to maintain our high investments in, among other things, improvements to the port infrastructure. In combination with the investments made by existing customers themselves in the port, this results in an extremely intense level of investment, something that is needed to stay ahead of the competition. Container throughput rose spectacularly by 10.9% to 13.7 million TEU (twenty feet equivalent unit, the unit for containers) and, by weight, by 12.3% to 142.6 million tonnes. In the second half of the year, tonnage throughput was 14.1% higher (12.4% in TEU) than in the same period in the preceding year. There has been steady growth over the past five half years. Rotterdam's share of the container market is now at its highest level since 2000 at 31% (2017 through to Q3). Most growth was seen for Asia and South America and traffic from North America. Feeder volume in particular grew strongly (21% in TEU) for all European shipping areas and in particular Scandinavia and the Baltic states. Growth in short sea amounted to 10.2% (TEU), with a particularly sharp increase in throughput for services to and from the Mediterranean and ScanBaltic. The hinterland volume also rose (6.3%). This growth and the increase in feeder volume confirm the strong position of Rotterdam in the networks of container shipping companies and major alliances. Throughput on Maasvlakte 2 rose sharply and volume also increased at almost all other terminals. The throughput of loaded containers increased by 12.1% (TEU), outstripping the rise in empty containers (6.1%). The throughput of crude oil increased by 2.3% to 104.2 million tonnes. This was mainly due to the higher utilisation rates for the refineries. The incoming and outgoing flows of mineral oils and oil products fell by 10.8% to 79.2 million tonnes, mainly due to fall in the exports of fuel oil from Russia. The level of fuel oil going to Asia also declined. A fall in the throughput of 'middle distillated products', in particular kerosene, was partially offset by a growth in naphtha throughput. LNG throughput increased by 16.5%, mainly as a result of higher deliveries to the gas network and the development of LNG bunker facilities. The throughput of chemical products remained stable, while biofuels rose due to a rise in European demand for biodiesel. Vegetable and animal products also increased in volume. The throughput of remaining products from the other liquid bulk category declined, as a result of which the volume for the category as a whole fell by 7.3%. Throughput of ores and scrap remained stable at over 31 million tonnes, although there was a slight shift in the tonnages, with scrap increasing and ore falling off slightly. Coal volume fell by 9.5% because eight coal-fired plants (two in the Netherlands and six in Germany) were closed and the other power stations produced less. The throughput of coke, which is needed for steel production, declined slightly. The Agribulk sector grew by 6.6% to 11.1 million tonnes. The amount of other dry and biomass goods tailed off slightly by 0.6% to 12.1 million tonnes. An increase in the throughput of biomass to Belgium was offset by a decline in other dry bulk. All in all, dry bulk fell 2.6% to 80.2 million tonnes. Roll on/Roll off benefited from the use of larger vessels, the expansion of the number of services and growth in existing services. The result was a growth of 6.2%. Other break bulk rose by 9.8% as a result of increased exports, the output of monopiles for offshore wind projects, higher input of steel and an increase in aluminium throughput. The Port Authority expects the throughput volume to increase further in 2018, with growth in the container sector being lower than the exceptional growth in 2017. The Port of Rotterdam Authority booked a turnover of € 712.1 million in 2017, an increase of 4.6% by comparison with 2016. Net profit amounted to € 187 million, a fall of 16.6% due to the fact that the Port of Rotterdam Authority was subject to corporation tax with effect from 1 January 2017. The exact amount to be paid can be determined only after the completion of negotiations with the tax authorities about the fiscal opening balance. Investments rose by 18.9% to € 213.8 million, the highest since the construction of the second Maasvlakte. Land leases, the largest revenue item, increased by 10% to € 377.3 million as a result of new contracts and indexation, or of the renewal of existing contracts at revised rates. This includes a one-off gain of € 25.8 million owing to the revision of contracts with clients. The revenue from port dues, the money paid by ships that visit the port, declined slightly by 1.7% to € 303.9 million due to a fall in the average price per tonne and an increase in discounts. Other income amounted to € 30.9 million, a rise of 8.7%. Operating expenses increased by 9.3% to € 261 million. The two main reasons are the increase in activities for the two strategic priorities, the Energy Transition and Digitalisation, as well as the contribution to the social dialogue concluded in 2016. In accordance with the existing long-term agreements, the Port Authority proposes a payment of € 94.6 million (2%) of the dividend for 2017 to the shareholders, the City of Rotterdam (70.83%) and the State (29.17%), with € 67.0 million being paid to the City and € 27.6 million to the State. 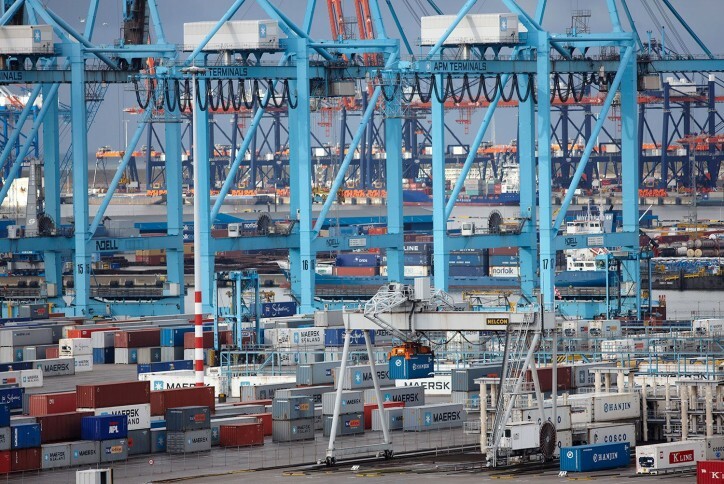 The mission of the Port of Rotterdam Authority is to create economic and social value by achieving sustainable growth in collaboration with clients and stakeholders. After the payment of the dividend and repayment of debts, the profits made by the Port Authority are invested in the further development of the port. In 2017, investments were made in, among other things, the Offshore Center Rotterdam, the new berth for Stena Line, the modernisation of berths in the Caland Canal, Maasvlakte Plaza and the RDM Grofsmederij as a location for new companies. The Port Authority invested a total of € 213.8 million last year, an increase on the investments of € 179.8 million in 2016. The Port Authority expects to maintain the high level of investment in the coming year. Important projects include the development of the Hartel Tank Terminal and the changes to the port railway via Thamesweg, eliminating the clash between transport by rail and ocean-going vessels.